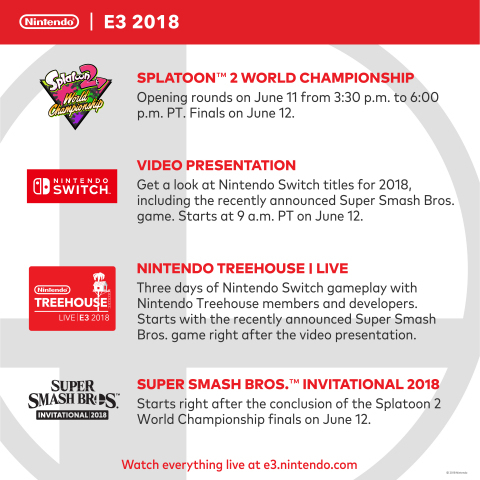 REDMOND, Wash.--(BUSINESS WIRE)--Nintendo is returning to the E3 video game trade show in June with fan-favorite activities and new features to keep watchers around the world and attendees in Los Angeles engaged and having fun. As in recent years, Nintendo will focus its E3 activities on games coming soon, with a special spotlight given to a key headlining title: the recently announced Super Smash Bros. game coming to the Nintendo Switch system this year. Games launching beyond 2018 will be featured at a later date.